For me, there is no contest. 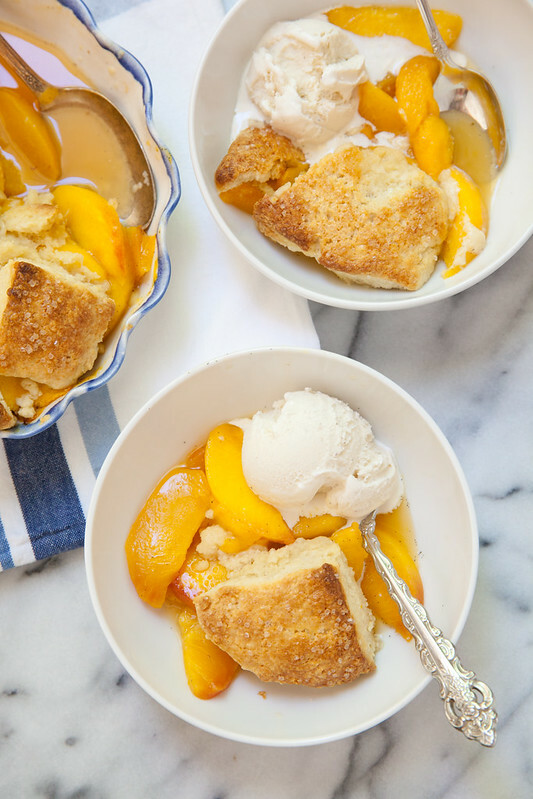 Peach cobbler is the ultimate iconic peach dessert and whenever fresh summer peaches are at their peak, I can’t possibly pass up the opportunity to make one. This version with enhanced with vanilla bean and a splash of bourbon is fantastic. 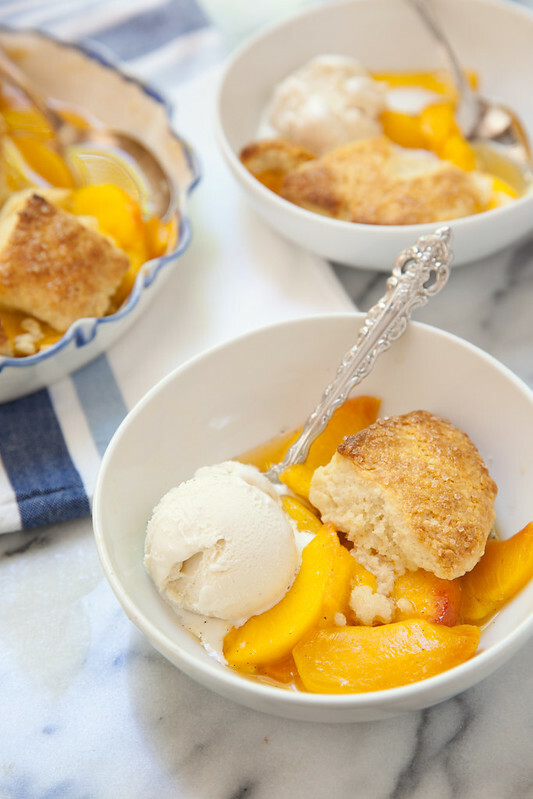 The fluffy biscuit topping is only lightly sweetened to let the natural sweetness of the peaches shine. Personally, I think a la mode is the only way to serve cobbler. However, if you are a bourbon lover and want to play up that flavor even more, consider topping this with bourbon whipped cream. Whip 1 cup of heavy cream with 2 tablespoons of powdered sugar until medium-stiff peaks form, being careful not to over whip. Blend in 1 tablespoon of bourbon and then adjust flavoring as desired. Serve this as an alternative to or in addition to the ice cream on the side. 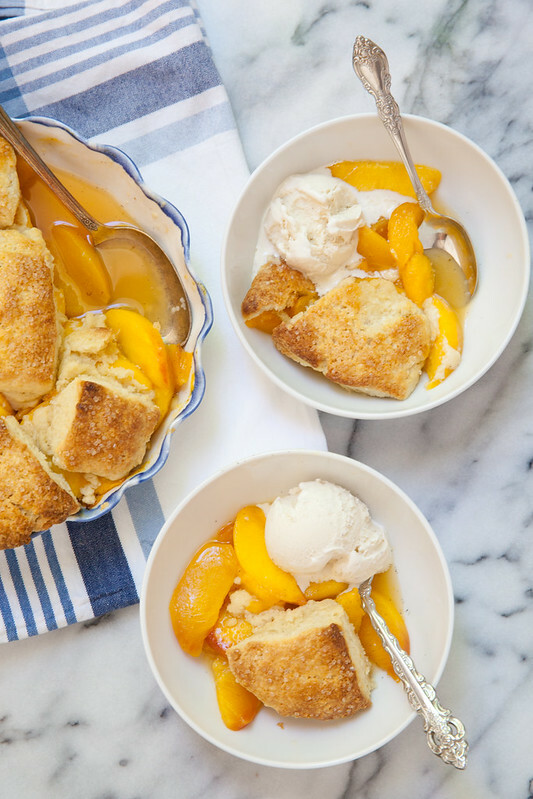 This is the perfect way to enjoy those lovely fresh peaches while they are in season! Make one of the peach recipes I share on the blog for this promotion. Share a photo of your creation with the world on Instagram! Be sure to include #wildforpeaches and also tag thepeachtruck, wildwoodmarket, and annieseats. IMPORTANT ADDITION! 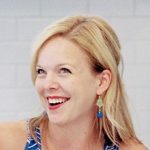 If your instagram feed is not public, I won’t be able to see your entry. Instead, email photos to me at annieseats at gmail.com. For an extra entry, tag two friends as well who might be interested in some Peach Truck action. The contest will stay open until Wednesday, July 13 at 11:59 pm. Three winners will be selected. You must be able to pick up your prize from Wildwood. Heat the oven to 400˚ F. In a large bowl, combine the peaches with the sugar, cornstarch, lemon juice, and the seeds scraped from the vanilla bean pod. Mix well to combine. Spread the peaches into a layer in a baking dish. In a medium bowl, combine the flour, sugar, baking powder and salt. Mix briefly with a fork. Using two forks or a pastry cutter, cut the butter into the dry ingredients until the mixture is coarse and the largest butter chunks are the size of small peas. Pour in the buttermilk and stir gently with a fork until a dough has formed. Be careful to avoid overmixing or kneading, otherwise you will end up with a tough dough. Turn the dough out onto a lightly floured work surface and pat to a thickness of about ¾- to 1-inch. Divide into 8 biscuits, either using a biscuit cutter or simply cutting with a knife. Place the biscuits on top of the peaches in the baking dish. Brush lightly with heavy cream and sprinkle with coarse sugar. Bake 35-40 minutes or until the peaches give easily punctured with a fork and the biscuits are golden brown. Serve warm a la mode or with bourbon whipped cream (see above).